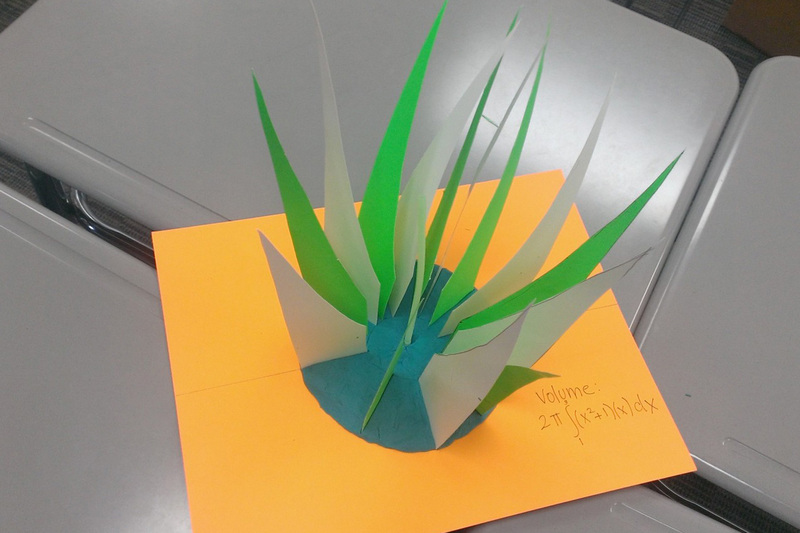 Communications Associate Emily Wilson writes about a visit to Cathy Falk’s BC Calculus classroom where students engaged in tangible spacial visualization. What do you think of when you think of AP Calculus BC? I, being out of a math classroom for quite some time, have memories of abstract concepts that made my brain strain and my eyes glaze over. I instead, gravitated toward the arts, and later went on to get my degree in Fine Art. So you can imagine my surprise and interest when I walked into Cathy Falk’s Calculus BC classroom and found students building sculptures. Students were cutting out shapes from brightly colored poster board, standing them up in varying patterns and positioning them in elaborate configurations. Math concepts were informing the creation of models, or in a word, artistic sculptures—a fascinating cross-disciplinary exercise. Two visuals clarify this exercise. Model #1 is formed first by a region bounded by the graphs of y = 1n x; y = 2, y = -1, and x = 0. Students drew this region on their poster board as a base of the object. Next the students cut out semicircles that are placed perpendicular to the y-axis. The diameter of each semicircle is bounded by the region on their platform. 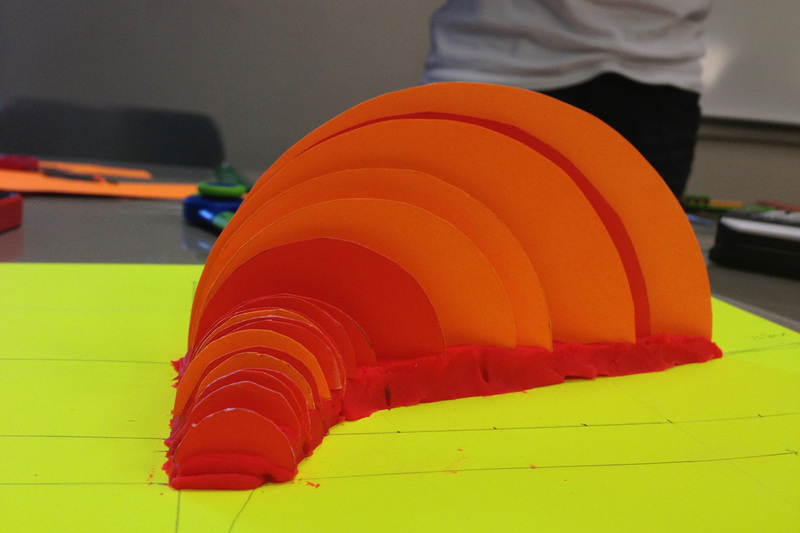 The students used play-doh to hold the semicircles in place. Model #2 is formed by first making a solid by taking the region bounded by the lines x = 1, x = 3, y = 0, and y = x^2 + 1. This was then rotated about the y-axis, represented by the straw. For more photos of students working on this project, click here. This entry was posted in Uncategorized by Greenhill Administrator. Bookmark the permalink.